As unfortunate as it may be to admit, "Christian movies" have something of a track record. Often the purpose of the filmmaker is clear, if not bluntly stated: to win souls, bolster the faith of believers, or even simply to get the name of Jesus to a theater near you. All too often, however, these well-meaning Christian films are marked by substandard acting, careless plot-holes, and contrived situations. Christian audiences flock to see such films, forgiving shortcomings and encouraging friends and family to support the Christian film industry by going out to see it and talking it up on Facebook. And yes, the end result of proclaiming the Gospel is a worthy one. After all, who knows what soul may be touched by the story presented? If even one person comes to seek Christ in a deeper way, many argue, the film has been worth it – no matter how poorly made or artistically subpar. But this artist and critic has begun to wonder, is the end truly justifying the means? I would love to say that PureFlix Entertainment’s God's Not Dead accomplishes its goals through strong storytelling, a clever script, and well-rounded, well-acted characters, but unfortunately that's not the case. Though this Christian-celebrity-cameo-filled affair tries to make a profound statement about bold faith, it falls prey to several predictable blunders. The film begins harmlessly enough, with an opening montage that introduces several unconnected characters, the most prominent being a freshmen couple at a college campus preparing to begin their foray into the world of university academics. Kara (Cassidy Gifford) is excited about their future; she and Josh have been a couple for six years, and she seems to have the next 60 planned out too. Josh (an underwhelming, brooding Shane Harper) is more laid back, and is thrown a curve ball on his first day of Philosophy class. This kind, Newsboys-loving, Christian teen has landed in the classroom of a militant atheist professor, one who wastes no time in proclaiming to his class of freshmen, "God is dead." In an attempt to bypass conventional philosophical debate over the existence of God, Professor Radisson (Kevin Sorbo) passes out blank pieces of paper to his classroom and instructs them all to write "God is dead" and sign their names. Josh, obviously, falters under this directive, and explains to his professor that, as a Christian, he cannot sign such a statement. The aggressive, controlling Radisson insists that if Josh won't do it, he has three chances to prove God's existence to the classroom or risk a failing grade. Josh accepts the challenge, much to the chagrin of his girlfriend, and the story sets off from there. The earnest young Christian standing up for his faith is a plot Christian audiences will relate to. After all, we live in an age of plurality and political correctness where lawsuits abound and there’s a lot of negativity associated with Christianity. The film comes across as self-satisfied, however, in a way that would likely feel polarizing and incomplete to a non-believer. Regrettably, most moments of poignancy and nobility this film can claim are overshadowed by this simplicity and a few other major flaws. One such example is that the film gives an underly-dynamic presentation of its characters. Every non-Christian character in the film is amoral, disrespectful, and vicious. One wonders: do the script writers view all non-Christians as being incapable of the barest common decency? Alternately, every Christian character somehow ends up at the same Newsboys concert at the end of the film. Is this because these filmmakers think all Christians go to the same Christian concerts in this manner, or is it simply a lazy way for writers to further the story for their own purposes? And why must every sad and sobering moment in movies take place in the rain? With these tropes and unrealistic scenarios, it’s difficult to take much of the film seriously. But even the predictable plot and one-dimensional characters would be salvageable if only the characters would behave and speak in ways that make sense – in ways that people in real life behave and speak. Unfortunately, this crucial element is sorely lacking from God's Not Dead. For example, when a young liberal reporter (a caricature of a role played by Trisha LaFache) accosts Willie and Korie Robertson (playing themselves), the scene is cartoon-like. She wields her recording device in a clenched hand and a nearly hyper-flexed arm straight toward the friendly couple, as if she’s afraid to get too close and catch what they've got. When they graciously agree to an impromptu interview, she begins with a snide jab at Korie, saying she's "surprised to see her" (even though the family is clearly just walking into church) and that she would have expected Korie would be at home "barefoot and pregnant." The list goes on and on. Couples break up in public places with bizarre, stilted dialogue. When a woman is told she has cancer by her doctor, her immediate response is "I don't have time to have cancer. I'm too busy." Two men about to embark on a 12-hour road trip are unable to start their car, so they call for a rental car (which doesn’t come ‘til the end of the day), and then when the rental is a dud… they decide to wait til the next morning for another rental (somehow, none of the adult men involved thinks to have the car towed to a mechanic and simply have the battery replaced). Logic is sacrificed again and again for the sake of moving the plot forward. But because everyone's dialogue and actions are so devoid of coherence, the plot feels forced. Many scenes that should be touching, or moments that should evoke empathy, leave you scratching your head, wondering, "Why did that just happen?" 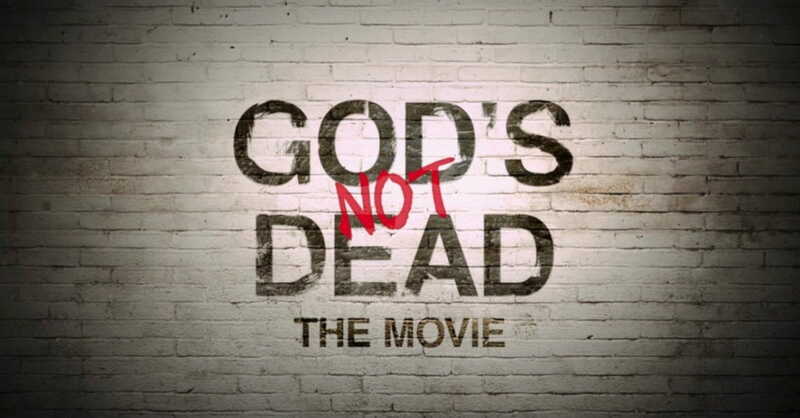 Yes, God's Not Dead will make you feel supported, possibly even inspired. You'll get to see Willie Robertson and Michael Tait wax poetic on their love for Jesus Christ. You'll get to see a dozen different characters turn their lives toward Christ (if you can manage to keep them all straight enough to care deeply about any of them). But is it really worth it? Is this pat-on-the-back type of inspiration worth the inevitable dismissal by non-Christians for its cheesy script and manufactured plot? Is it a "necessary evil" to support such lackluster films for the cause of Christ? Do the noble ends justify the means to get there? Perhaps more importantly, is it even possible for movies about God to simultaneously be movies that are good art? Yes. It's been done many times. Movies like The Prince of Egypt and The Tree of Life come to mind as two of the most well-crafted, star-studded, magnificent films in recent years which also happen to be incredible stories of faith. At the end of God's Not Dead, viewers are encouraged to send a text message to everyone in their contact list proclaiming "God's Not Dead." You can do this, if you think it will spread the love and message of Christ to your friends and family. If, however, you live in a more nuanced reality, one where actions and conversations and relationships with real people take time and patience to grow, maybe you'll pray for them instead. Maybe you'll send a text to just one person saying "I'm thinking of you, let me know if you ever need anything." Or maybe you're an artist, and you're just waiting for the right time to unleash your creativity and passion in a way that will not only point to God, but will be thoughtful, well-crafted, and carried by a story that connects to the human heart. After all, our God is alive – and the ultimate artist. Doesn't he deserve thoughtful, worthy art attached to his name more than just an on-screen-tract? Debbie Holloway is the Family Life Editor for Crosswalk.com.